Liberation monument in Roosendaal, The Netherlands. 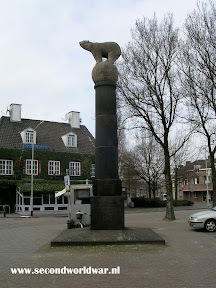 The Polar bear of the 49th Infantry Division on top of a column. We were making satisfactory progress in driving the German Army out of South Wales Holland Northwards towards the River Maas and its estuary. It was nearing the end of October 1944 and this particular operation had started over a month earlier when we broke out of the bridgehead we had established over the Antwerp-Turnhout Canal, driving into Holland from Northern Belgium. Naturally, our Battalion had incurred casualties in the course of our various engagements with the enemy, including the loss of our Platoon Commander, Lieutenant Trevor Bevan. Whereas we would normally receive reinforcements from our own training regiment of the South Wales Borderers7as a matter of expediency, occasionally we were made up to strength with newly-trained troops from other infantry regiments, and we received into our Company a batch of fresh-faced lads from North Lancashire and Cumberland, five of whom came into our Platoon. In the meantime, one of our corporals had moved to another platoon as Platoon Sergeant, another had been wounded and evacuated and to fill the gaps two of us youngsters, 'Babs' Babbington and I got our first stripes to lead the two sections concerned. Babbington was a rather brash, aggressive character, whose general attitude gave the impression of "I'm going to win a V.C. or bust". I suppose it was "bust" in his case as it turned out. He was severely wounded a few months later, evacuated to the U.K. and not seen again in our Battalion. The first action after our "new boys" joined us was the capture of Roosendaal, a largish town just over the Dutch border which fell after two days fighting. Our own Company, as I recall, was not heavily involved in street fighting, which was a relief, but quite an amusing incident occurred when in moving through the town, my objective was the next street corner on which stood a cinema. There were no enemy troops in occupation (perhaps the films weren't good enough! ), but it wasn't a satisfactory vantage point as far as I was concerned, because of the lack of windows which we could use as fire-points. We set ourselves up in the foyer and I had a further look inside the cinema while we waited for the next of our troops to "leap frog" beyond us. * On Lt. Kernick's side of the road during our "morning activities"
I found that there was a window high up beyond the stage which would serve as an excellent observation/fire point and also a ladder which would give access to the window. I duly sent one of our new boys", Bryson, up the ladder with his rifle, and with instructions to keep his eyes peeled. "...We rushed to help him expecting to find him at least with broken limbs, if not peppered with shell splinters, but found him comparatively unharmed, although we did learn from him several shouted expletives which were quite new to us." Things were comparatively peaceful, apart from the occasional shell passing overhead and wreaking its destruction elsewhere, but suddenly there was an almighty explosion as one hit the wall of our cinema near the window, sending Bryson, rifle and ladder crashing down about twenty feet onto the stage. We rushed to help him expecting to find him at least with broken limbs, if not peppered with shell splinters, but found him comparatively unharmed, although we did learn from him several shouted expletives which were quite new to us. After Roosendaal we then pressed on Northwards, moving through territory captured by 1st Polish Armoured Division and an American Division. As part of the overall objective of capturing the ancient town of Willemstadt further North and on the River Maas, our own Company was given the task of capturing an obscure village en route. We were almost completely unhindered by enemy shellfire while moving up, but shortly before arriving at our "start line" I was surprised to see 20/30 German troops lying dead in various attitudes outside their slit trenches forming one of their defensive positions. I just hoped they hadn't been massacred after surrender and that the bodies had been collected and put ready for burial in those trenches, but the Polish troops were not renowned for compassion towards an enemy who had inflicted so much suffering on their people. It was evening and the light was beginning to fail when we started our attack, which took us over open country towards the village which comprised just a handful of houses and some farm buildings and we were supported by a heavy artillery barrage. We didn't come under any small arms or mortar fire as we approached the objective and, as usual, our artillery was spot-on accurate, only lifting when we were about 30 yards from the enemy positions. We dashed on, firing our weapons from the hip expecting to take any survivors prisoner once we got amongst them. To our surprise we found the positions deserted, which explained the lack of opposition. We carried on past the houses, still without meeting opposition, and the plan was then to form our own defensive positions just beyond them. It was a relief, but something of an anti-climax, that the enemy had disappeared and Babbington shouted across to me "The bastards! They've gone. Let's go and get them". To my surprise I found myself catching his mood and shouted back 'Yes, let's get after them". There was open country to the right and no sign of any fleeing enemy but in front, left, was an area of woodland via which route we assumed they had withdrawn. Off we both went in the gathering gloom and had gone 100 yards or so when we heard Jack Wallen, our sergeant and acting platoon Commander shouting "Bobs, Dai" (his nickname for me), "come back you silly buggers, COME BACK W! The urgency of his shout brought us to our senses and realising how ridiculous it was for us to be out there on our own, back we went. We had hardly got back out of the wood when our own artillery laid down a massive barrage of shells on it, with the object, no doubt, of doing the job that Babbinton and I had in mind but far more efficiently. "'You stupid idiots. Do you think you can take on the bloody German Army all on your own? What the hell do you think our artillery is trying to do for us now?" Schofield was an experienced soldier, who had been with the Battalion all the way through the campaign. In fact, there were only five men still in the Platoon who had landed on D-Day. It was light, sandy soil and easy to dig, so it didn't take us long to finish digging in, but in any case this was an operation which we always undertook with some urgency. Suddenly, however, enemy shells started screaming into our positions with uncomfortable accuracy and we got as far down in our trench as we could, thankful that the shelling had not started earlier when we were exposed. By now it was pitch dark and the danger, as I saw it, was that this was a counterattack with German infantry in amongst our positions as soon as the shelling stopped - the boot on the other foot compared with our normal experiences. This particular worry was relegated suddenly when a shell landed right in front of our trench with a huge blast and a deafening explosion, half collapsing the wall of the trench and partly burying us in loose soil. It might have been the concussing effect of the blast but Schofield, normally a fairly cool customer, started shouting and struggling to get out of the trench, while I held him down and tried to reason with him that he was much safer where we were. He soon saw sense and was back to normal within minutes while we agreed that it was long odds on another shell landing so close or into the trench. The shelling stopped. We got our heads up and, thankfully, no enemy arrived. We would have been completely unable to defend ourselves if they had. My sten-gun was blocked with soil and Schofield couldn't work the bolt of his rifle for the same reason. We set to, tidying ourselves up and getting our weapons back into working order and Jack Wallen arrived to check on the state of our health and readiness, while all the Platoon, naturally, remained on full alert. The night passed without incident and in the morning we were able to see the concentration of shell-holes around our trenches. The enemy had pinpointed them well and we put the mischief down to a few self-propelled 88mm guns, which could have operated with less risk than in daylight when there would have been a strong possibility of their being hunted out by our rocket-firing Typhoon aircraft, which had almost complete control of the skies. Schofield had the most vague recollection of the previous night's happenings when I spoke to him about it in the morning and was obviously still in a rather confused and concussed state. I hadn't got away scot-free myself, however. A very severe earache developed in my right ear some hours after the incident. This was later diagnosed as a damaged eardrum, which our M.O. cheerfully assured me would soon heal itself. (I think it did). "...there were only five men still in the Platoon who had landed on D-Day." We had got away comparatively lightly, suffering only a few casualties in our Platoon and the Division's advance having moved on, the morning was peaceful while we awaited our further orders. During this lull, our Company Commander, Major Mcllvenna, arrived at our trench, which had been extended and widened somewhat due to the shell damage and our subsequent tidying-up operation. 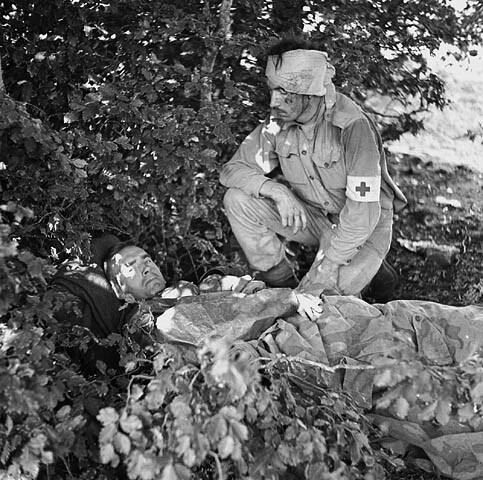 "This will do" he said and with that our two Company stretcher bearers arrived with the body of Pte. Ridley. We were without a Battalion Padre at this time as he had suffered serious wounds when a shell struck the Regimental Aid Post, killing the Medical Officer and some of the wounded they were tending. Perhaps in these particular circumstances, as we were not engaged, it was the Company Commander's responsibility to see to the burial of the dead; anyway, young Ridley(*1) was lowered into our trench, and Major McIlvenna conducted a simple but sincere burial service over the blanket-wrapped body in the present of Schofield, the two stretcher bearers and me. A Canadian Captain with a strecher bearer in Italy 1943. - Source National Canadian Archives. It was the first and only burial of one of my comrades which I attended. Almost invariably we had been moving forward and left our casualties behind us for others to attend to. It was particularly touching in this case as Ridley had arrived amongst us only very recently with Bryson and Co., and the fine-looking fair haired lad had hardly had time to settle in with us. I thought I had become hardened but I found it very moving as we said a special prayer for his parents and family. The Battalion's efforts, if I remember rightly, were not required further in this operation as the Germans withdrew their forces across the river to avoid being cut off. It was, therefore, decided that we should have a change of scenery and we were sent off to join in the endeavours to make progress in the East, through the forests, mud and minefields protecting Venlo, a Dutch town almost on the German border -another rather unpleasant task. These recollections where written by John A. Davies. 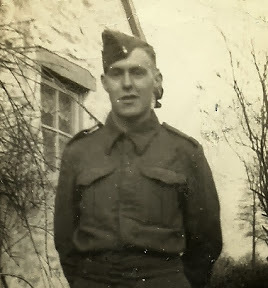 He was an infantryman in the 2nd Battalion of the South Wales Borderers. The battalion was part of the 56th Independent Brigade when it landed on D-day and later joined the 49th Infantry Division. Later in the war the battalion transferred to the 53rd (Welsh) Infantry Division. *1 - Private Ralph Ridley, service nr. 14735653, died 4 November 1944 at age 18. He is buried at the Fijnaart-en-Heiningen Protestant Cemetary. Son of Joseph and Eva Elizabeth Ridley, of Aspatria, Cumberland.